Often, when we long to discover more about who Jesus was and why he came, we turn to the Gospels. But Jesus’ way of helping his followers to understand him was to begin in Genesis and work his way through the rest of the Old Testament. What would we see of Jesus if we were to do the same? In Seeing Jesus, author and Bible teacher Nancy Guthrie takes readers through 60 selected Old Testament readings to show how Jesus is revealed in its people, promises and prophesies, in its sacrifices and shadows. Your eyes will be opened to the epic scope of the Bible’s story like never before, as you see Jesus at the center of God’s plan to save from the very beginning. As parents we strategize and agonize. We wish for a secret formulas and sure-fire methods. But somewhere along the way we discover that what our kids need most is for God to do in their lives what only he can do. Help yourself to a daily dose of parenting perspective, a daily infusion of hope, and a daily call to trust in The One Year Praying the Bible for Your Kids. 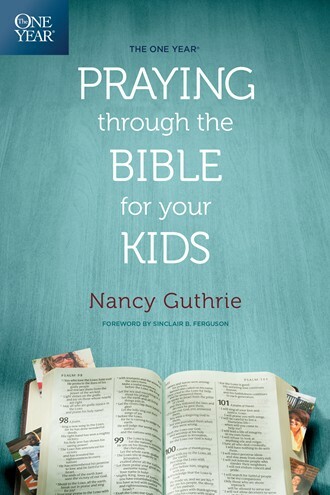 Join trusted author Nancy Guthrie in discovering how the scriptures speak into the triumphs and turbulence of parenting as well as provide fresh words for our prayers. Following the One Year Bible reading plan, Nancy mines each daily reading for insight into what it means to receive God’s grace as you parent as well as extend that grace to your kids. Day by day you’ll find yourself worrying less and praying more as your dreams and desires for your kids are shaped more by the scriptures than the culture around you. Let go of fear and expect God to work as you pray through the Bible for your kids. One Year of Dinner Table Devotions & Discussion-Starters helps families start where they are already gathered together on a daily basis—around the dinner table. As the meal comes to a close, family members can take turns turning to the dinner-table devotion for that day—which includes readings from several Scripture passages that relate to each other, a brief devotional , and discussion-starter questions—all designed to be done together as a family in 10 to 15 minutes (before everybody helps with the kitchen clean-up!) to create a meaningful and personal discussion everyone takes part in. We tend to look to the New Testament to tell us about Jesus, yet it was the Old Testament about which Jesus said, “the Scriptures point to me!” In Discovering Jesus in the Old Testament, Nancy Guthrie takes readers from Genesis through Malachi shining the light of Christ on the promise of a descendent who will put an end to the curse of sin, the story of a father who offers up his son as a sacrifice, the symbol of a temple where people can meet with God, the prophecy of a servant who will suffer, the person of a king who will rule with righteousness— and so much more. God has come to you, to bless you. In the first chapter of the Bible, we read that God created Adam and Eve and “blessed them.” And the rest of Bible is the story of God blessing his people through Christ. Over 365 days these gospel-rich daily readings will take you through the Bible, inviting you to savor the abundant goodness God intends for you to experience and enjoy. Each day you’ll be reminded of yet another way God has loved you and will still be loving you into eternity.